I had a surprisingly nice lunch in Pasadena last week. It was a relatively new place called, Cham Korean Bistro (walking distance from where I used to live). 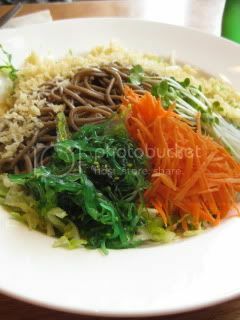 Their food is not necessarily fusion, but the dishes are more like "California-style" Korean. So, you can imagine lots of colorful vegetables etc. with healthy choices. My friend had a cold noodle dish. She liked it. 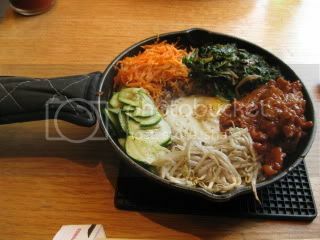 I had their version of dolsot (stone-pot) bibimbap. It came in a cute skillet with a handle. I loved the presentation. 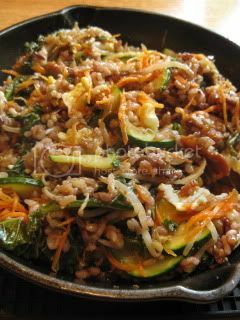 A fried-egg in the center was surronded by multi-grain brown rice, and the rice was topped with lots of vegetables with your choice of main item (I picked pork). I quickly started mixing the ingredients in the sizzling hot skillet. Ready to eat. It was really nice, and I loved the fact that there were a lot of vegetables in the dish. Perhaps, the seasoning was a bit too sweet to my taste, but overall it was a very nice dish. The place was packed during the lunch time. Other dishes looked very nice, too.